I just had a really awesome Sunday afternoon braai with my girlfriend’s family, and I was thinking I should share some of MY tips to getting a braai just right. I’ve found 2 types of wood that have a medium burning time but have very long coal heat time. Kameeldooring (also known as camel thorn) and anything that comes from Namibia. Kameeldoring is more expensive than normal wood, but there is a reason for it – it is always dry and makes very good coals. If you can find those beaten up trucks on the side of the road that sell Namibian “hout”, you are in luck. Ask the guy how the wood is and he will say “Dis soos yster!” (It’s like iron!). The meat is entirely up to you. Chicken, sosaties, chops, wors, snoek, you name it, everything goes. Anything from your local supermarket or even better, the butcher will do the job. Don’t skimp on the meat because not even a braai will fix that “ou skaap vleis”. Braai salt is a must for the chicken. My favourite braai salt is the BBQ salt with garlic made by marina. (The bright orange and purple plastic container available from every supermarket). As for braai sauce for your chops goes, there is nothing better than Jimmy’s braai sauce. Trust me on this one when I say, this stuff is legendary. Spar were the only stockists of it, but lately I have seen Pick ‘n Pay as well as Checkers start to stock it as well. There are a number of other sauces available – Steers, Spur, BBQ this, BBQ that, but they really don’t stand up to the great Jimmy sauce. Getting the coals at the right temperature is crucial. You don’t want burnt meat, but you also don’t want to run out of coals and have your chicken undercooked. A rule of thumb for those beginners is once your wood has turn into glowing orange and red coals, and you can hold your hand over the coals for about 2-3 seconds, you can start the braai. Always start with the chicken as it takes the longest. It really is the weirdest thing, but chicken wings and drumsticks take surprisingly long relative to their size. Next you can slap on the chops, sosaties or whatever you having to braai. You can put everything on at the same time if you have the space, but as I say, get that chicken on first. Sprinkle the spices onto the chicken on both sides. Don’t be shy with the braai salt. If using normal pepper and salt, I wouldn’t put too much salt on the chicken. Marinate the chops a couple of hours beforehand if possible, otherwise keep coating the chops with your sauce while they on the braai. Remember to also keep turning the meat. You want the chicken to be golden brown all the way round, and the chops to look slightly crispy and juicy. If you not sure, use a steak knife and cut through the middle of the meats. Chicken must be slightly moist (no running juice) and your chops should be pink with no blood. Wors, which goes on last as it cooks the quickest, must not be pink inside, but brown. Fish is a very tricky thing to braai, especially snoek. But the very best way I have found to have a moist and tasty snoek is to braai it in a foil jacket. Also just as important is the sauce you must cook the snoek with. Take some lemon, lots of garlic, lots of butter and some apricot jam and cook in a pot on the stove. Keep stirring the sauce until everything has melted. Keep to one side while you make the foil jacket. Create the foil jacket by taking a very large piece of foil, and placing the snoek in the one half of the foil. Pour all the sauce over the fish. Now fold the foil over the snoek until the bottom and top end touch. (Foil comes in long pieces, so take the bottom and top end of the long piece and fold in half.). Then take the edges and fold over and over until you create a packet of sorts. It must be completely airtight because once you put it on the grid which is over your coals, the packet will blow up like a balloon and the snoek will cook in the steam that the juices create. This gives the snoek a moist texture, which is exactly what you want. No one likes a dry snoek. Once the packet has blown up, it should take between 15-20 minutes until the snoek is cooked through. This my friends will win you many a braai contest. Let your mates take care of the salads, breads and so forth. If you want to cook the garlic bread on the fire, that should take around 5 minutes. To see if its ready, take your tongs and press the bread from both sides. If it’s soft, its ready. All guys have their way of doing things, and when its not your turn to braai, shut up and drink your beer. Offer to help, but if the braaier declines your offer, stay well away from his meat, unless he asks you to keep an eye on it while he pops inside to the toilet or to grab more spices and sauces. Also don’t offer your advice on how to braai, because you definitely won’t crack an invite the next time your mates decide to braai. Rather wait until its your turn to braai to show off your skills. Your mates will quickly pick up on your slick hands and meat handling which they will, in time, try out themselves. This is the only way that skills are transferred around the braai. The ONLY way. I’m sure you okes have some tips as well, so please do share. I spotted a real UFO! Have a look in the sky. You see that silver dot? Ok, so it doesn’t look like much when you look at this photo, but download the original photo (2.39mb), which was taken with a 4 mega-pixel Panasonic Lumix DMC-FZ20EB camera. The original size of the image is 2560×1920. Here is the UFO cropped from the original. I can’t make out remotely what it is, so I’d have to put it down as a UFO. 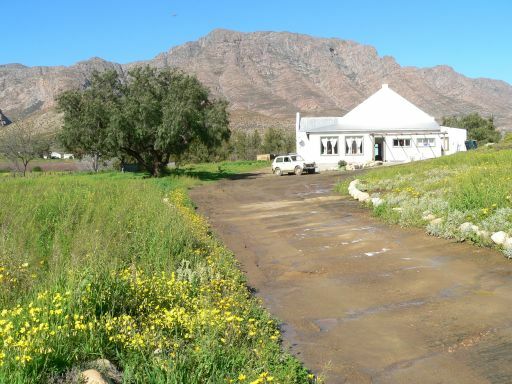 The photo was taken outside of Barrydale, in the little Karoo, so it’s literally in the middle of nowhere. Not sure about this fact, but aren’t most UFO sightings, normally spotted in remote areas? Well, the Karoo is as remote a place you going to find. 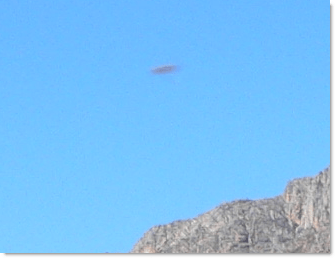 Posted on 11 September, 2006 22 February, 2009 Categories South Africa15 Comments on I spotted a real UFO!